Project partners agree that assessment of skills and skill matching is a significant layer of an effective integration strategy. 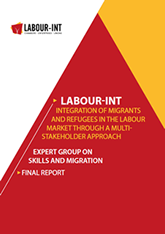 The objective of the Expert Group on Skills and Migration (EGSM) is to increase capacities of all players within a multi-layered integration strategy to perform assessment of skills and skills matching, according to the specific conditions of asylum-seekers and refugees. The EGSM is composed by researches from FIERI (Forum Internazionale ed Europeo di Ricerche sull’Immigrazione), trade union specialists from ETUC, EUROCHAMBRES, CEEP, ITC-ILO, the European Training Foundation (ETF) and CEDEFOP. Concerned European Commission services and national experts will be invited by project partners according to the needs. The objective is to set tools to profile skills of asylum-seekers and refugees along the entire integration chain which may include language learning, civic education, social assistance, VET, balance of competences, labour market active participation, having as an output a CV that is recognised by the local labour market and used for skill matching. Capitalising on existing policy frameworks elaborated at international level the objective is to prepare a playing field for labour integration of migrants at European level: examples are the ETF's-MISMES (an Inventory of Migrant Support Measures from an Employment and Skills perspective), CEDEFOP's VNFIL (Validation of Non-Formal and Informal Learning), the European Qualifications Framework (EQF) and Europass. Working tools for skills assessment, validation of skills and skills matching are made available to the UnionMigrantNet members and networks of all social partners for immediate use and dissemination.